Posted on 03. Apr, 2009 by Corey in Dayton Dragons Baseball, General Baseball. As I talked about yesterday, the Cincinnati Reds play an exhibition game on Saturday at Fifth Third Field in Dayton, Ohio against a team made up of the Reds top prospects in the minor leagues. 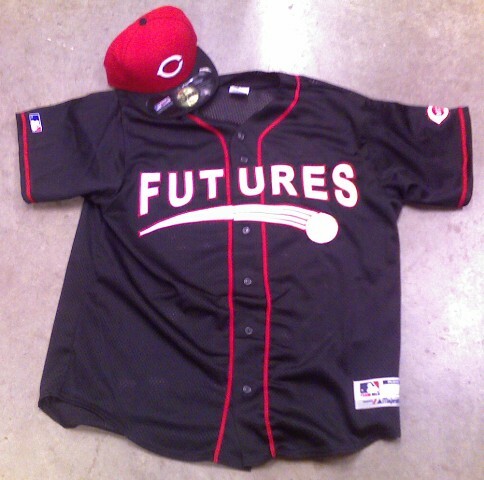 Above is a picture of the jersey that the players on the “Futures” team will be wearing. The back will have the players name along with a jersey number, mostly that the players got to chose. This appears to be an exciting event and one that will hopefully be continued in the future. I also posted the roster yesterday of the Futures team that will play against the actual 25-man roster of the Reds, plus a few extras that they are bringing from Triple-A. Although the Reds pitching is still unknown, who do you think will win this game? I heard that Jordan Smith was starting for the Futuros, is that right? Also, Stewart was going to follow him up. Do you make the pitching order? Did you hear about the final cuts today? Let us know, we want to hear. Come one Corey, hurry up. I am pretty sure the pitching coordinator made the pitching order for the game. Jordan Smith is starting and is rumored to be followed by 4 other pitchers, one of them being Stewart. do you and the other clubhouse managers try to console the released players? You guys probably get to know some of them real well. I will tell you that watching players getting released is tough, but a part of the game. I come from a college athletics background, where you can’t trade or release players. Usually, you have them for their four year career. Professional baseball is a business, so trades and releases happen and it can be hard on a clubhouse. There have been a number of guys that I have gotten to known that are no longer with the Reds. For some guys, baseball is all they know and getting released could be the end if they don’t find another team. I gave him a call and gave him your name and email…hopefully you hear from him soon…I know he is busy since they are in the middle of their season.